I adopted Kieren from a group called Feral Fixers. My cat, Galen, had recently died and I wanted another young, playful cat to act as a playmate for Arwen who had been making a nuisance of herself towards the other cats ever since Galen had gotten ill. He'd been her play buddy for several years and when he first took ill and could no longer keep up with her, I started thinking about what to do on her behalf. So, I determined to get another cat after Galen had passed. He was too sick to take on the additional stress of another cat in the house and I wanted him to pass his final days in as much comfort as I could provide for him. About a week after Galen died, I contacted several of my friends who volunteer with local animal groups. I sent links to the videos I had of Arwen as well as a description of her personality and explained what I was looking for. One of my friends, Sue, wrote back with a list of several young cats that were in foster care with the organization she volunteered with, Feral Fixers. They are a Trap, Neuter, Return (TNR) group. They trap free roaming cats, get them neutered or spayed and provide them with basic immunizations before returning the ferals to the area they were trapped. Any young kittens or "friendly" adults are put into foster care for socialization until they can be adopted. I read the descriptions of the cats Feral Fixers had listed on their Petfinder page and with Sue's help, narrowed it down to three possible contenders. 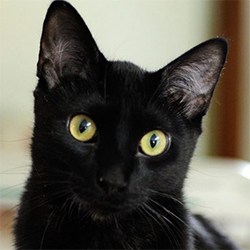 I immediately gravitated towards the black, male cat named Reymond, for a couple of reasons. First, I also had to consider the other cats and I thought Caitlyn (who had gotten along fine with the boys but never warmed up to Arwen) might take more readily to another male cat in the house than another female. Second, I have a special place in my heart for black cats who are often maligned because of their fur color. They are the hardest cats to adopt from a shelter despite being some of the friendliest cats I've met. So, we made arrangements for me to meet Reymond at his foster home. I stopped off on my way home from work, ready with paperwork, checkbook and a carrier, just in case everything worked out. The couple who had been taking care of him said he might be shy at first. However, he was anything but. He came right up to me, plopped himself down on the floor and rolled over to have his belly rubbed. So, I left with a new fur family member that night. It took several months of gradual introductions to get Kieren and the rest of the cats acclimated towards one another. He and Arwen regularly chase each other around the house and even Caitlyn seems to tolerate him pretty well (or as well as can be expected for her). He's turned out to be a big goof ball, plopping himself down where ever he is or leaping kowabunga style after Arwen to play with her. He's also a food hog. I can no longer leave food out all the time or he'll eat it all. Each morning and evening, the cats get a little over an ounce of canned food as well as about a 1/4 cup of dry. I have to separate them so I can ensure the girls, in particular, are getting enough food. After 1/2 an hour, I pick up any uneaten food. Canned food goes back in the fridge for the next meal and the dry in a cupboard. Kieren is an extremely affectionate cat and "talks" in a half purr all the time. To curb his enthusiasm and burn off some of his excess energy, I've been trying to get him to walk on a leash. It's been a bit of a challenge and he has managed to escape his harness a couple of times, giving me a bit of a fright. He's still not sure about the whole, walking around outside thing. As for his name, I, of course, wanted to keep with my Celtic theme, so I chose Kieren as it's Irish/Gaelic for "little dark one".